The lion lies in his den and sleeps in the daytime, but at night he goes out to find his food. ou have seen pictures of the lion a hundred times, I suppose, and perhaps you have seen it alive; would you not like to know what the Bible says about it? You have heard it called the "king of beasts," because it is so strong and so bold; it is afraid of no other animal, and it is strong enough to carry away a horse or a buffalo. In the 30th verse of the 30th chapter of Proverbs, we read about "the lion which is strongest among beasts, and turneth not away for any." When king David was mourning for the death of Saul and Jonathan, he said, "They were swifter than eagles, they were stronger than lions." How strong Samson must have been to take hold of a young lion and tear it in pieces with his hands! Did you ever read a riddle in one of the chapters of Judges? This is it, "Out of the eater came forth meat, and out of the strong came forth sweetness;" and it was made by Samson after he had found the honey in the skeleton of the lion,-as I told you when speaking of the bee. He promised some of his friends that he would give them thirty sheets and thirty changes of raiment, if they would find it out in seven days; but they would not have been able to do it, if Samson's wife had not told them what he meant. Then they came to him and said, "What is sweeter than honey, and what is stronger than a lion?" The boldness of the lion is noticed in a verse in Isaiah: "Like as the lion and the young lion roaring on his prey, when a multitude of shepherds is called forth against him, he will not be afraid of their voice, nor abase himself for the noise of them." In Proverbs, 28 : 1, you will read, "The wicked flee when no man pursueth; but the righteous is as bold as a lion." This is true, dear child; and if you will love God and trust the kind Savior, there is nothing in all the wide world of which you need be afraid. God can take care of you as he did of Daniel, even if you were shut up in a dark cave with cruel and hungry lions around you. The lion lies in his den and sleeps in the daytime, but at night he goes out to find his food. His eyes are a little like those of a cat, and he can see in the night better than we can. The Bible says, "Thou makest darkness and it is night; wherein all the beasts of the forest do creep forth. The young lions roar after their prey, and seek their meat from God. The sun ariseth, they gather themselves together, and lay them down in their dens." It has soft feet, like a cat, so that it can creep quietly along and not frighten the animals that it means to kill, till it comes very near them. Sometimes the lion lies in his den, very still, until some animal comes by; then he gives a sudden spring, and seizes it just as a cat seizes a mouse. The Bible says, when speaking of a wicked man, "He lieth in wait secretly, as a lion in his den; he lieth in wait to catch the poor; he doth catch the poor, when he draweth him into his net." The lion has very strong claws hidden in the soft cushion of his paws, and when he has caught his prey he uses them to tear it in pieces. His tongue is like that of a cat, only a great deal more rough, and with this he can strip the flesh off from the bones. David in one of the Psalms prays that God will save him from an enemy, "Lest," he says, "he tear my soul like a lion, rending it in pieces when there is none to deliver." The roaring of the lion is very terrible, especially at night. He seems to delight to be wandering around for his prey when it is dark and stormy; then when he puts his mouth near the ground, his roaring sounds like thunder, and all the animals that hear it are full of fear. You have read of Satan, that most wicked being, who would be glad to make us as wicked as he is; the Bible says he is like "a roaring lion, walking about, seeking whom he may devour." Let us pray God to keep us safe from this roaring lion. 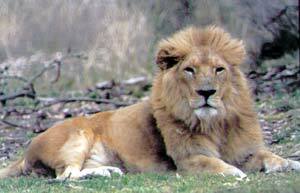 Christ is sometimes called "the Lion of the tribe of Judah." He is always gentle and kind to those who love him; but if we will not receive him as our Savior, the day is coming when he will meet us in judgment; then where can his enemies hide themselves.